The night sky above Mt. 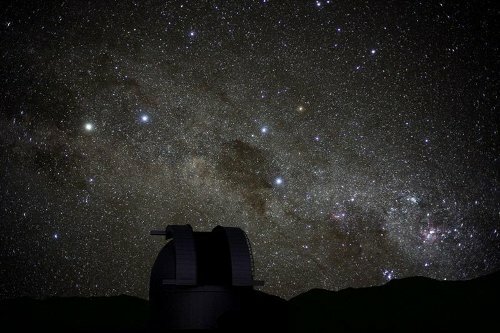 John Observatory in New Zealand, where a second active hunt for Alpha Centauri planets has taken place. This and a third Centauri project, Debra Fischer’s work at the Cerro Tololo Inter-American Observatory (Chile), give us hope that Centauri B b may be confirmed in the near future. Note the Southern Cross (just above and to the right of the dome), with Alpha and Beta Centauri the two stars to its left. Alpha Centauri (the leftmost bright star) is a triple system made up of Centauri A, Centauri B and Proxima Centauri. Voyager 1, now 17 light hours from Earth, continues to be my touchstone when asked about getting to Alpha Centauri — and in the last few days, I’ve been asked that question a lot. At 17.1 kilometers per second, Voyager 1 would need 74,000 years to reach the blistering orb we now believe to be orbiting Centauri B. Voyager 1 is not the fastest thing we’ve ever launched — New Horizons at one point in its mission was moving with greater velocity, though no longer, and the Helios II Solar probe, no longer functional, reaches about 70 kilometers per second at perihelion. But Voyager 1 will be our first craft to reach interstellar space, and it continues to be a measure of how frustratingly far even the nearest stars happen to be. Cautionary notes are needed when a sudden burst of enthusiasm comes to these subjects, as it seems to have done with the discovery of Centauri B b. What we need to avoid, if we’ve got our eyes on long-term prospects and a sustained effort that may take centuries to succeed, is minimizing the challenges of an interstellar journey. Making it sound like a simple extension of existing interplanetary missions would create a public backlash once the real issues become clear. Better to be straightforward, to note the vast energy budget needed by an interstellar mission, the conundrum of propulsion, the breathtaking scope of the distances involved. Marc Millis told Alan Boyle just after the Centauri B b discovery that manned missions were almost certainly not going to be our first attempts to reach the stars. We can work out scenarios where the global economy grows to the point where a civilization moving into the Solar System can afford to build huge laser installations that could propel a lightsail to perhaps ten percent of the speed of light. Get up to that kind of velocity and you make the Centauri crossing in less than half a century, but only for a flyby. Deceleration is another matter, and even if, as Robert Forward showed, there may be ways to decelerate a lightsail at destination, the mission then extends to at least a century and, given our assumptions, perhaps a good deal more. Read more: Centauri B: Targets and Possibilities — Centauri Dreams.